Vintage images from the golden era of postcards, 1900-1918. Postcards of famous resorts and exotic places are still available, but the period from 1900-1915 must surely mark the period when every little town or village was photographed as the subject for a penny postcard. Libraries, hospitals, landmarks, impressive buildings, homes of notable citizens, and even simple street scenes were all fodder for the camera. Millions of these little epistles were sent all over the country by visiting friends and relatives, some bedecked with glitter, some embossed and gilded, but most just plain scenes of faraway places to be shared with the folks back home. 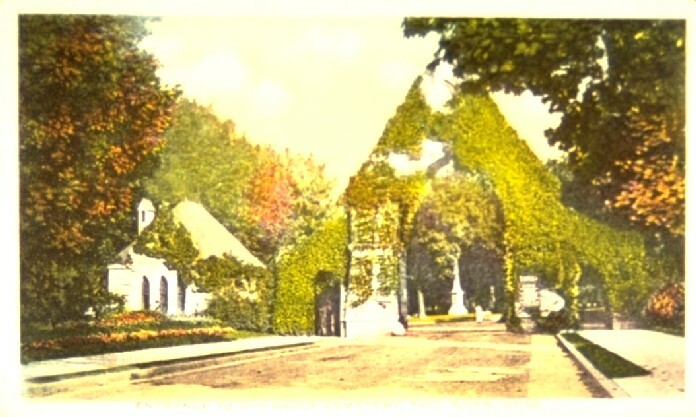 A few postcards of Oak Grove’s famous entry arch exist with the words, “The Shadows Have Fallen and They Wait for the Day”. 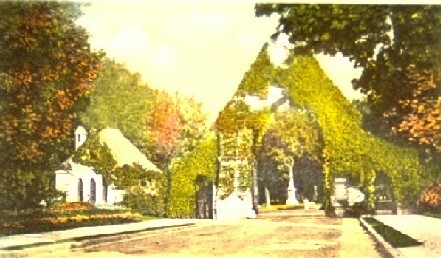 The early cards show the gate without the clinging ivy. 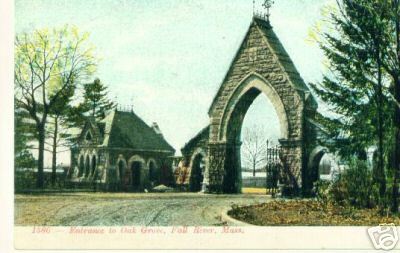 Oak Grove postcards are easily found in antique stores and on Ebay in the $4-$8 price range and are wonderful collectibles. The concept of a beautifully -landscaped park where families might come to visit departed Loved Ones was first fully-realized in London’s Highgate and Cambridge’s Mount Auburn. 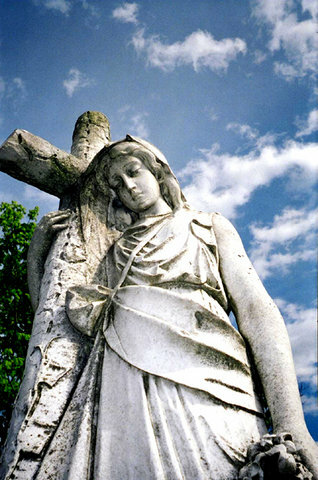 The Victorians rivalled the Ancient Egyptians in their ritual observances of death and burial, monuments and memorials. 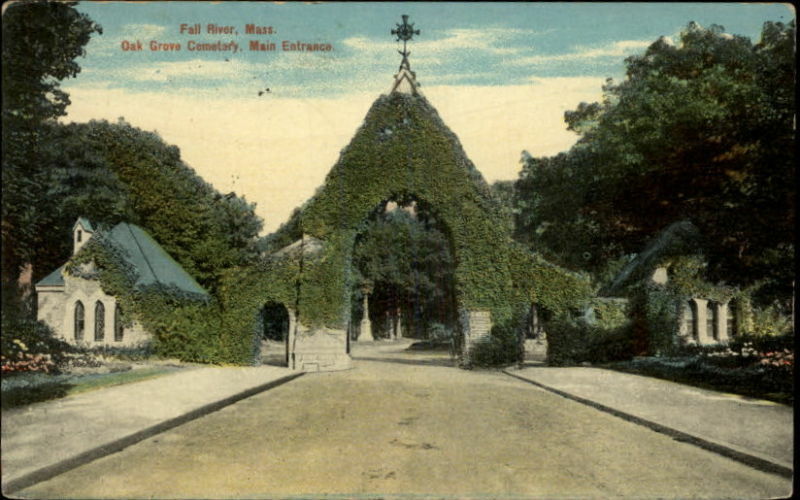 Beautiful Oak Grove Cemetery in the North end of Fall River is one of many New England mid- century Victorian memorial parks where the streets are named for trees, and fanciful wrought iron gates enclose the fine families of the city like fences of stately homes in the earthly life. 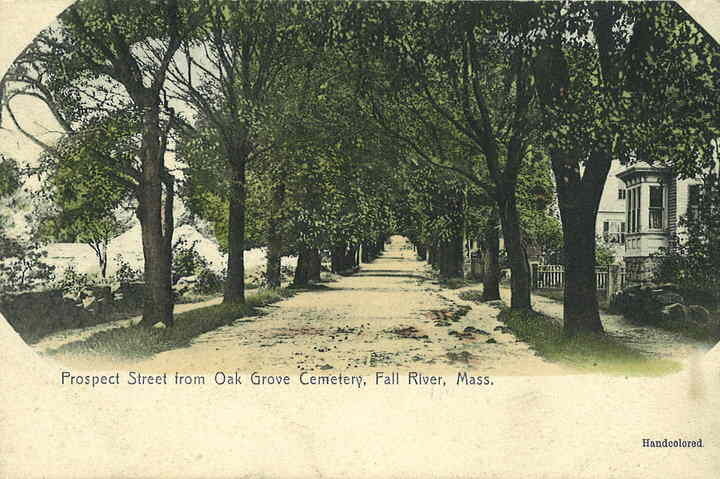 For those who love cemeteries, – the peacefulness and quiet of the Past- Oak Grove holds unparalleled verdant vistas and peerless carved monuments of another age. 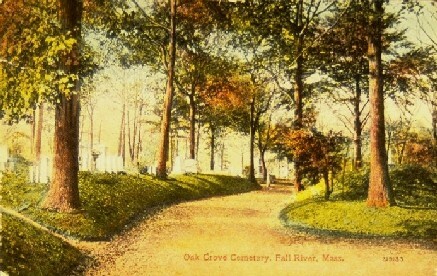 Whether a student of Victorian symbolism , or of Fall River history- a pensive hour spent in silence at Oak Grove is a retreat from the pressures of modern society, and a glimpse into the intriguing past of the city’s notable citizens. Plagued with the problems all cemeteries are faced with today, vandalism, landscaping and maintenance costs, security, lack of volunteerism, etc. 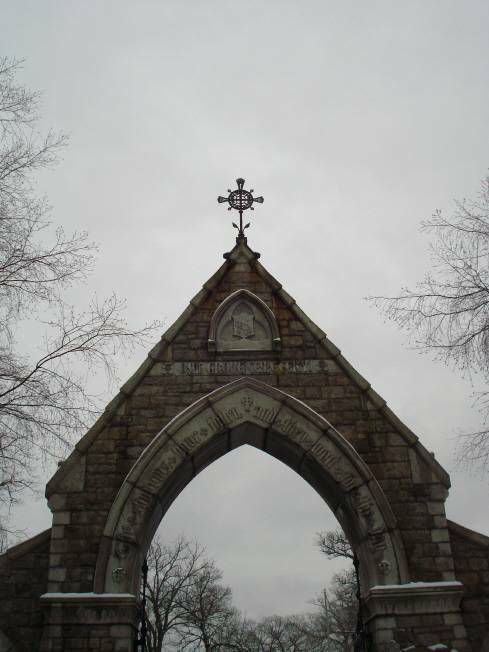 -perhaps now is the time for those who truly appreciate the heritage and history enclosed within the gates and walls of Oak Grove to come together.